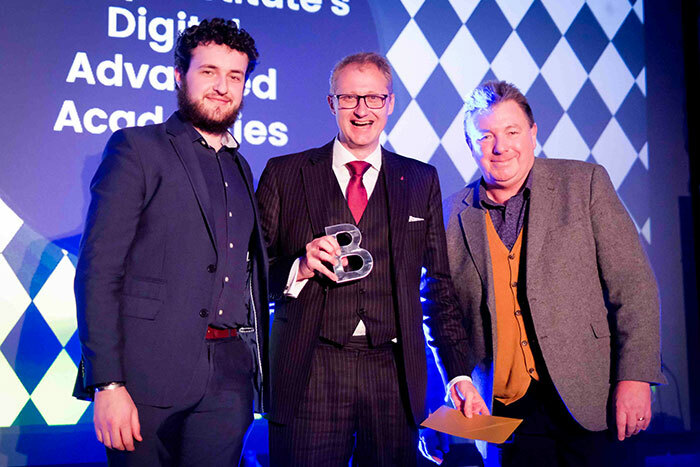 Bentley Institute’s Digital Advancement Academies have been named as the winner of the BIM Enabler/Consultant of the Year Award at BIM Show Live 2019 in Newcastle upon Tyne, UK. The annual BIM Awards, part of the national conference, honor and recognise the world’s best BIM work by celebrating exceptional and innovative use of BIM in the built environment. Adam Young (left), associate academies manager, and Iain Miskimmin (center), senior academies manager for Bentley Institute’s Digital Advancement Academies, accepted the BIM Enabler/Consultant of the Year Award at BIM Show Live 2019. The BIM Awards were judged by experts in BIM strategy and implementation for today’s modern digital built environment. Awards were given in ten categories. The awards were announced the evening before the main programme kicked off for BIM Show Live 2019, which also featured presentations by experts in the construction industry, including David Philp, Global BIM/MIC Consultancy Director, AECOM and co-author of Building Information Modeling for Dummies.